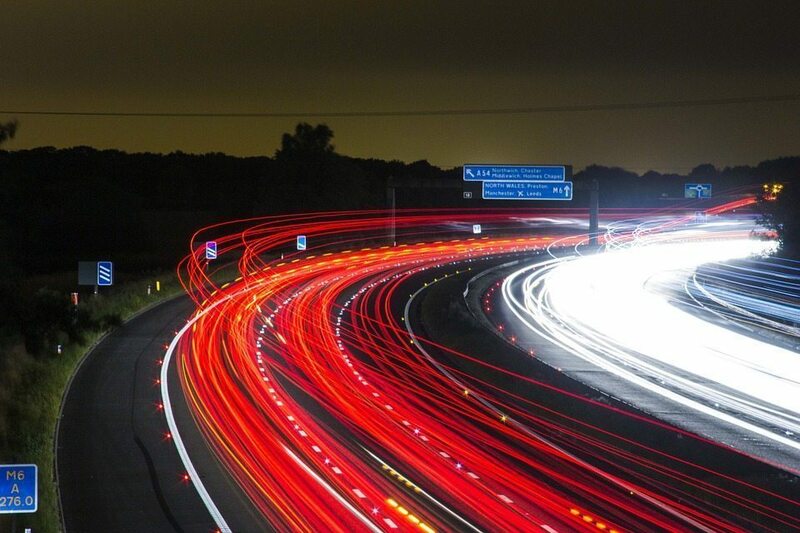 Traffic affects ranking in SERP, but how? 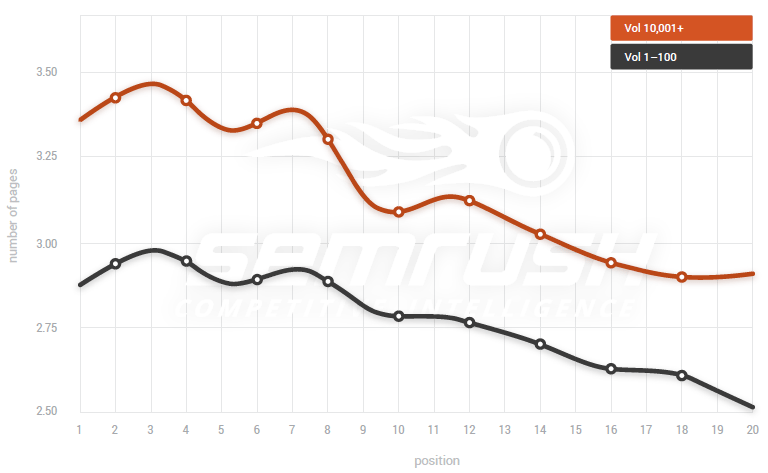 Find out here in the final part of our 6-part analysis of the SEMrush SEO Ranking Report. Part 1: Introduction, methodology, and key ranking factors. Part 2: How website security affects SEO. Part 3: How backlinking and referring domains influence SEO. Part 4: Content length and its ranking factors. Part 5: Which parts of on-page SEO are the most important. Welcome back! You must have come for more tips on perfecting your SEO strategy. Following the first five parts of Edgy Labs’ probe into the SEMrush research study, we are now down to our 6th and last part that will focus on website visits and how they affect SERP ranking. In our previous article, we discussed the importance of on-page SEO elements. Apparently, optimizing all the key elements of your site and coupling it with some thorough link building strategies will lead to significant things: an increase in organic traffic and/or website visits. Utilizing different tools in your SEO effort can definitely increase your traffic. Now, the question is, how does traffic affect a site’s SERP ranking? Will the behavior signals coming from visitors have a ranking impact on a website? 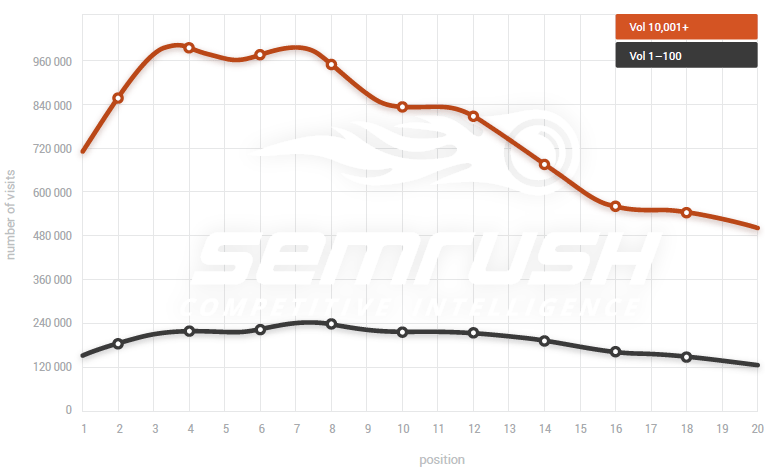 We’ve done the legwork for you scouring the SEMrush SEO Ranking Report, so read on to find out! According to the research study of SEMrush, site visits are an important indicator of a website’s online popularity. Technically, the more visitors a site gets, the more popular it becomes. 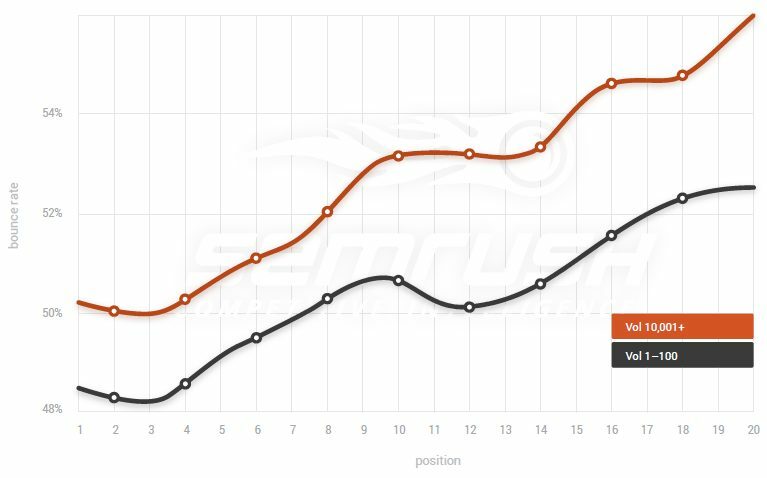 On the last part of the research study conducted by SEMrush, their team tried to find the relationship between traffic and page rankings, and whether organic searches have the greater influence. Then, the team compared the total number of non-unique visits and the total number of non-unique visits–except the ones that came from organic searches–to know if organic search visits will affect the final results. As per usual, and for better understanding purposes, the results were segmented into four keyword volume groups. According to the SEMrush study, pages closer to the top of the SERP ranking get more unique visits every month than those that rank lower. Also, domains that usually rank for low-volume keyword groups have fewer visitors as compared to domains in high-volume groups. As per the graph above, the flat trend in the low-volume keyword group indicates that a page’s ranking position is not directly related to its number of total visits. However, the small number of page visits for high-volume keywords becomes evident for websites below the 12th position. 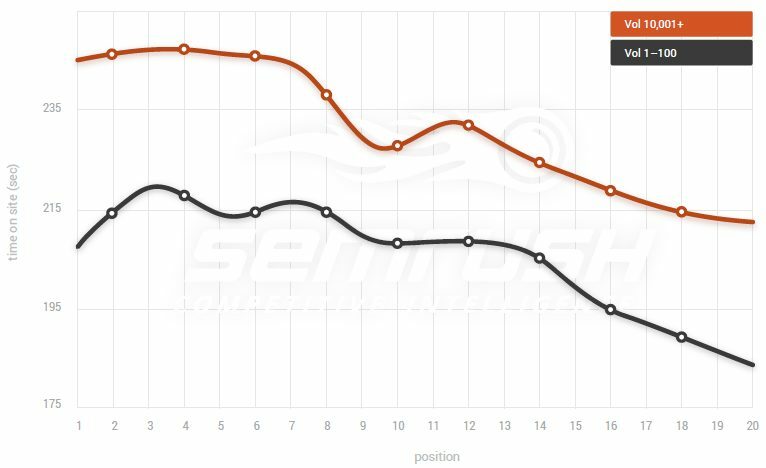 For the third and last portion of the web visit study, the SEMrush team found that organic search has no effect at all on the final page rankings. Furthermore, the trend curve for high-volume keyword group is still more abrupt than the low-volume keyword group. As part of the research study conducted by SEMrush, they also analyzed several user behavior signals such as bounce rate, time on site, and the pages per session that a user opens. The content of a website is engaging. The website navigation is convenient for users. The users react positively to a website. Using the same number of search queries, the SEMrush team calculated the median-value bounce rate, the amount of time that the user spends on the domain in general, and the number of pages a user visits per session. 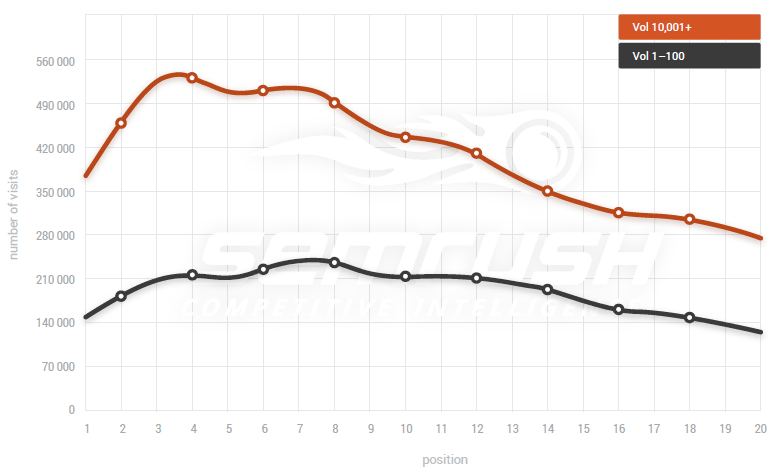 As shown on the graph above, the higher the position of a website is, the lower its bounce rate. Meaning: people are more engaged with high-authority sites than less popular sites in the lower ranks. It also appears that high-volume keywords have a bounce rate of 49 percent while low-volume keywords have 51 percent bounce rate. For the time on site behavior signal, it is evident that users tend to spend more time on high ranking websites. According to the study, a user spends an average of 40 seconds less for low-volume keywords than for the high-volume keywords. For the pages per session study, the SEMrush team found out that on average, a typical user navigates through three to three-and-a-half pages per website, per visit. Apparently, as a website moves towards the top of the SERP ranking, it receives more page visit per session. Taking into consideration the results of the website visit study stated above, it clearly shows that the difference in page visits for the first ten positions and the following ones is more evident in high-volume keyword groups. This can only mean that high authority domains get to be prioritized by Google when ranking for high-volume keyword group. Also, the fact the organic search has no direct effect on the final page ranking only means that you should also focus on other strategies to gain traffic. Keep in mind that building a strong brand image must always be a part of your SEO strategy. If you want a tool to track your traffic better and help you improve your optimization efforts, SEMrush offers Traffic Analytics. Traffic Analytics is a tool that will allow you to see the channels that fuel your website traffic. It will help you gain access to valuable data like organic, paid, social, direct, and referral traffic. You can view the information all at once or by categories. The traffic estimates provided by SEMrush Traffic Analytics are based on clickstream data that comes from multiple proprietary and third-party data sources, so you are guaranteed that the figures you will see are reliable! In addition to that, it is also important to note that behavior signals are key factors to consider if you want to know how users react to your site. Huge bounce rate percentage may not mean that your site is not useful. However, it is a good indicator if your content is compelling enough to keep online users on your website. This concludes Edgy Labs’ 6-part series about the SEMrush Ranking Factor 2017 research study. 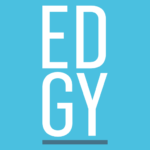 Always check our website for more growth hacking topics and latest news in technology today!